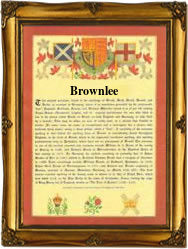 Recorded as Brownlea, Brownlee, Brownlie, Brownlees, and even Brunlees, this is a Scottish surname. It originates from a place formerly known as "The lands of Brownlee", in the county of Lanarkshire, or possibly from another village called Brownlee in Ayrshire. The meaning of the name is probably "Brun's farm", from the pre 8th century Olde English "Brun" a personal name, which developed into the surname Brown, and "legh", a fenced enclosure in the forest, suitable for agriculture, or in other words, a farm. Both Lanarkshire and Ayrshire formed part of the old kingdom of Strathclyde, which was an English dependancy, and where English was the spoken language from ancient times. It is not absolutely clear when the first recordings took place, but certainly in 1563 a Widow Brownlees was given as being a tenant of lands belonging to Newbotle Abbey, Ayrshire, and Issobel Brownleis was also a tenant on church lands, but this time those of Kelso Abbey in 1567. Janet Brownlee was recorded in Ersiltoune in 1653, and John Brounlie was the parish clerk of Carluke in 1624. Sir James Brunlees who died in 1892, was a famous Victorian engineer.